10/2/2015: Morning Workout: November Project: The Quad Thrashing Continued! Yesterday I ran nine miles on the treadmill at the New York Sports Club near my office in White Plains, New York. I didn’t run in the morning because I needed the extra hour and a half of sleep. Solid move. The only problem: running on the treadmill is incredibly boring. I pounded out 7:30 miles without any problems, but I would have preferred the hills of Central Park. Keeps it interesting, at least. 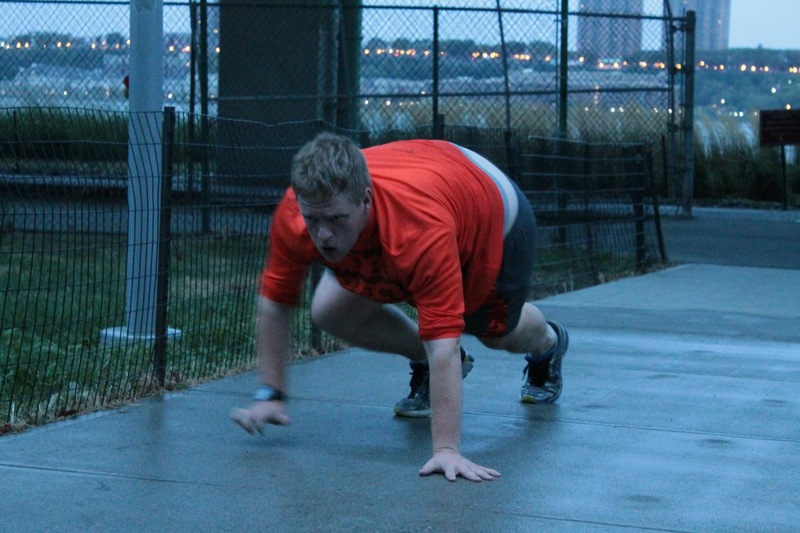 Wednesday I wrote about November Project NYC’s quad-heavy workout. I was hoping that this morning’s NP_NYC exercises would diverge from that format. Again, alas. We met at 68th Street and Riverside Drive, a location only ten blocks from my apartment. I jogged to and from the workout. The intersection sits atop an entrance to the West Side Greenway, and sports a steep set of stairs down to the Hudson River. At the bottom of the stairs is an entrance to a field with an incredibly steep hill. You see where I’m going with this. We split into two groups and partnered up. Group one started at the base of the hill. While one partner planked, the other sprinted up the hill to the top, and sprinted (or slipped, slid, and rolled) to the bottom. Once at the bottom, the runner would straddle the planker and run over him. Once past the planker, the planker became the runner, and vice versa. Repeat for 10-12 minutes. The goal of the straddling, according to John, one of the Tribe leaders, was to make things as awkward as possible. He wasn’t too far off. Group two started at the top of the stairs. Partner one stayed atop the stairs alternating between five dips and five pushups. Partner two ran down the stairs, lunged from the stairs to the West Side bike path (for me, about 20 lunges), bear-crawled back to the stairs, and ran up them. Switch with your partner and repeat for 10-12 minutes. After 10-12 minutes groups one and two switched and did the other circuit. 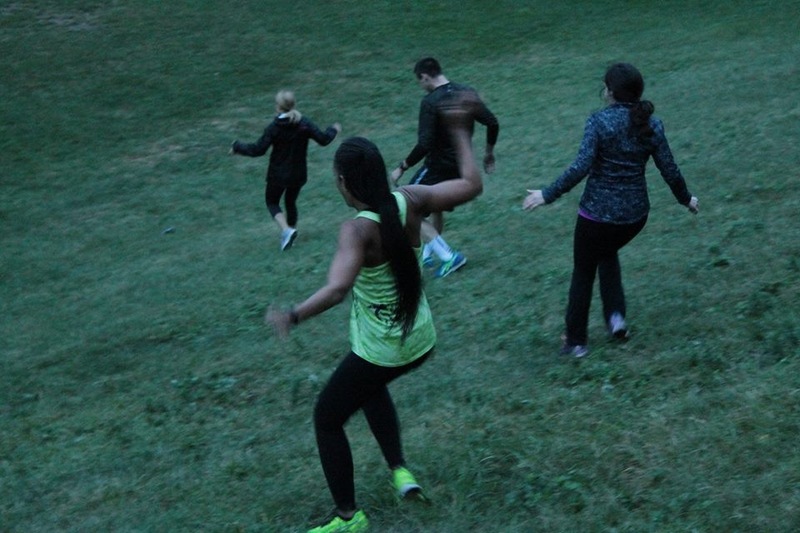 As you can see, hill running, lunges, and stair running all engage the quads. So, once again I punished myself with short bursts of quad speed. Overall I felt good running up the hill, but the stairs (which I did during the second half) hurt. The most difficult part, though, was the dips/pushups combo. 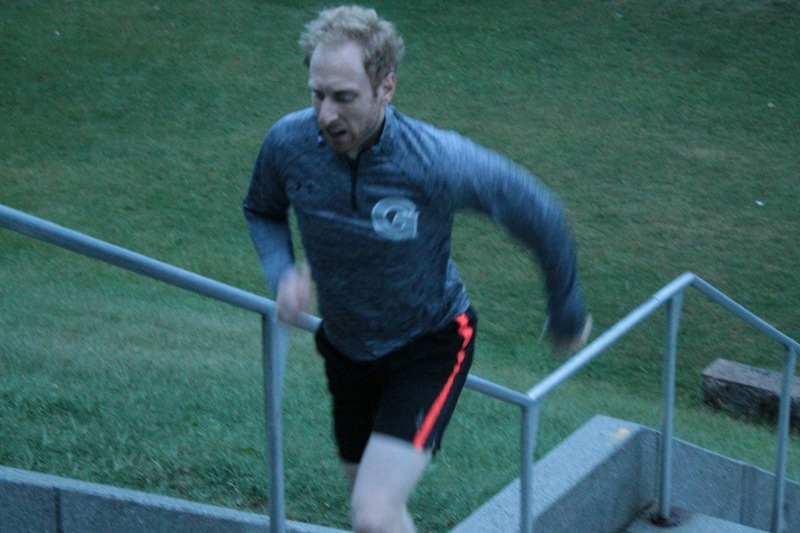 The stairs/lunges/bear crawl/stairs segment took 2-3 minutes, which is enough time to do a lot of dips and pushups. After the 20th dip, though, you no longer want to do dips and pushups. Relative strength is really important for running, though, so I can grin and fight through it. Overall, though, my legs felt better this morning than on Wednesday. Sometimes a long, easy run like the one I did on the treadmill yesterday eases the muscle soreness. As always, the NP_NYC crew found a way to elevate the cold rainy morning into a joyous experience. High fives up and down the hill, Billy and John rolling down the hill in every direction and getting dizzy and confused in the process, Amir pushing it hard each plank and each uphill sprint: They help keep the energy and spirit high. I also like when John and Paul, the other Tribe leader, jump into the workout and push it with us. It keeps the anarchical spirit of the group alive and well. And really, everyone who #justshowsup: that’s the hardest part and most important for keeping the group going! If you’re running Grete’s Great Gallop half marathon in Central Park this weekend, kill it! If you’re like me and putting in a long run for the NYC Marathon, good luck out there. And if you’re just taking it easy, then take it easy like a prince. ← 9/30/2015: Morning Workout: 5:28 a.m., November Project: Quad Torture!